Regarding the man-machine interaction, the ability to recognize and synthesize facial expressions allows the machine to gain more communication skills, on the one hand by interpreting the emotions on the face of a subject, and on the other by translating their communicative intent through an output, such as movement, sound response or color change. An IKEA lamp becomes a Natural Interaction system which senses human emotional states through facial expression. It uses OpenCV for image processing and analysis to identify emotional state through the movements of face’s fiducial points. The lamp, made with an Arduino Duemilanove, changes its color to represent the user’s current emotion. In particular, it receives via serial communication, the values of pleasure, arousal and dominance, following the PAD emotional state model, as inferred from the facial expression and changes accordingly the color of the RGB LEDs. and where is the webcam or kinect sensor which scans the control points? 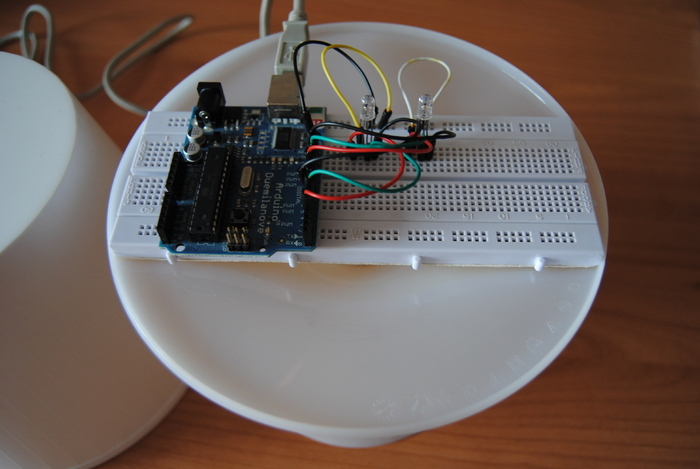 Hi Peter, currently the mood lamp uses the webcam and the elaboration of a laptop, but I’m working on integrating everything inside the lamp without the needed of an external computer. and look for a crowdfund. Smiling may be contagious! Where can i find its circuit diagram and code? Can u please post them here?